You are currently browsing the tag archive for the ‘david mitchell’ tag. So, the readathon… How Did It Go? As planned I immersed myself in The Bone Clocks by David Mitchell and got some 20% down. Love it! I’m glad it’s a tome and I still have the majority to go. :) I’m sorry I can’t give you a short summary of this magical realist novel yet – I’ll have to see where it’s going first! The birthday party that broke up this RaT was of family I hadn’t seen in a long time. Of course I was very eager to see and speak to everyone, but it didn’t take long or I longed to be back in ‘Mitchell-verse‘. During some housework I also listened to a short story on audio by Esther Verhoef, called Nouveau Riche. I hadn’t read anything from her yet and I now don’t think I will again. The account of expats in France reluctantly receiving friends from the past was largely predictable and not at all exciting. It was… just okay I guess. To help me keep track of time I used the Timelytics Time Log app on my phone. Handy! This surprised me as it feels like I read for more than a scant seven hours. I could have gotten in another one at the end but I was hungry and got distracted by making lunch. Before I knew the readathon was over! :( But I’m not going to let that spoil my mood: it was fun and I haven’t read this much in twenty-four hours for a long time! In my start-up post I didn’t know yet where I’d pop up in cyberspace. It happened to be on twitter (where I hadn’t been for a long time either; it’s becoming a theme! ;) Twitter is quick and dirty easy, which makes it perfect if you want to feel connected but spend not too much time at your computer or mobile device. And socializing, I realized, is something I really love about Dewey’s readathon and missed some of the previous times I participated. A big thank you to Cautious‘ Katja B. (@eeyorenyk) whom made me aware of it (ánd was a faithful cheerleader). Jotting down my plans for next time here so that I’ll know where to find them in six months time. I’ll try to completely clear my schedule so I can devote the full 24 hours to the readathon. I’ll reserve some time for socializing — and to keep me to it I may even sign up as a cheerleader! get some drafts set up. go read in a library for a while. I’d like to thank all cheerleaders, hosts and participants whom made this readathon a success. And I salute the memory of Dewey, without whom we never would’ve had this marvellous event. I wonder if it’s a (perfect) coincidence that there was a cameo of Professor Dewey in The Bone Clocks today??? 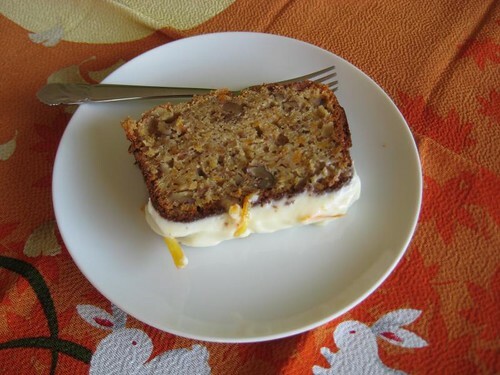 Wow, two blogposts in one week? Sure, why not! It will probably be even more because tomorrow I’m participating in the biannual 24 hour readathon. I’m playing by my own rules and adjusted the time element because my cousin is hosting a “Just sixty” birthday party and I don”t want to miss that (either)! The official times for my region are 2PM Saturday – 2PM Sunday. As I have to leave for the party around 3:30 ánd need to get dressed for the occasion -you all watch Downton Abbey and know how it works, right?- that doesn’t leave much room for reading. So I’ll be brave and set my alarm clock at 7:30 PM to start RaT-ing early! We’ll get to the party venue by bus on which I hope to be able to do some unofficial cheerleading. If I don’t get carsick that is… >.< Once home again I’ll probably go to bed and get up indecently early next day. 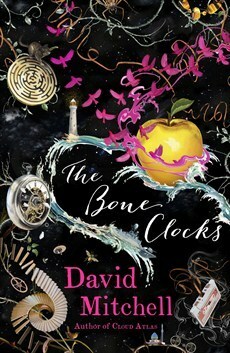 I plan on immersing myself in just the one book: The Bone Clocks, by David Mitchell. *happy dance* Mitchell is my favourite author and I’ve been looking forward to this novel SO much! I wonder which old acquaintances will I meet? The book is 600+ pages and I want to finish it before a book club meetup on November 15th. That won’t be an easy feat in my current reading pace. So I have started already and am currently on page 15. My progress can be followed on Goodreads and I may occasionally post here too. In case I really need a change of palate I will be reading short stories from Haruki Murakami’s The Elephant Vanishes. Can’t wait to get comfy and read-read-read! I probably won’t be participating in (m)any mini challenges because I know they just distract me from reading. The same goes for blogging and spending time on social media. But you never know where you’ll meet me in cyberspace during the RaT! Where can I find you? This is the first, of hopefully many, guest posts by Mr Gnoe. As a listology addict he compiled a Black Swan Green Soundtrack for us! There is a lot of ‘boyish’ music, like Madness, Elvis Costello, Adam Ant and the Specials. Music a boy wouldn’t have to be embarrassed about to like in front of his friends. But secretly Jason likes some ‘softer’ songs as well, like ‘Heaven’ by Talking Heads and John Lennon’s #9 Dream (not coincidentally Mitchell’s second book is called number9dream). All the songs in the book together form a nice soundtrack. In the 80s I would’ve made a Black Swan Green compilation cassette but now it’s a playlist for my iPod. Here’s what’s on it! The first chapter ‘January Man’ starts with the phone ringing in the office of Jason’s father. From his sister julia’s room ‘Don’t You Want Me’ is thumping out dead loud and kicks off the book. Julia is playing these two melancholic songs in her room, telling us (the readers) she’s not as tough as she pretends to be and not as lucky as Jason thinks she is. Jason secretly plays Julia’s Roxy Music LP in her room (“Julia’d go ape!“). At first I thought I had spotted a goof, because Virginia Plain was Roxy Music’s debut single but was not included on their debut LP. Wikipedia tells me it was rereleased in 1977 to promote their Greatest Hits album, so this must be the LP in Julia’s collection. Jason is seriously impressed by Julia’s boyfriend Ewan’s new car and his taste in music. An incredible song filled the car from four hidden speakers. ‘”Heaven”,’ Ewan told me, breezy but proud. ‘Talking Heads. David Byrne’s a genius.’ I just nodded, still taking it all in. Feeling good, Jason lays down on his bed and listens to ‘Mr Blue Sky’ five or six times in a row. Jason is away with his dad on a business trip. Going around town he hears music: Madness in a cafetaria, UB40 in the hotel at night. Some girls share the earphones of a Sony Walkman and sing ‘Hungry Like A Wolf’. The Walkman was first produced in 1979 in Japan. Some girls are singing ‘The Lion Sleeps Tonight’ in the back of the bus. This is originally a South African song, first recorded in 1939 but probably much older. The version you couldn’t not have heard in 1982 in England or in the Netherlands was the version of Tight Fit. It reached no.1 in both countries even though it was recorded with session singers and not the models playbacking the song Boney M-style. The Goose Fair is in town, and walking around the fairground Jason picks up music from different directions. He especially likes that ace song ‘Olive’s Salami’ by Elvis Costello. Another song he notices goes ‘Hey! (HEY!) You! (YOU!) Get Off Of My Cloud!’, coming from the Flying Teacups. It doesn’t say in the book wich version of the song is being played (the original is of course Rolling Stones, 1967) but I like to think it’s the a-capella version by Flying Pickets from 1982. The grand finale of the book. Jason, who was not really a loser, but far from popular has suddenly earned the respect of his class mates (No spoiler – I won’t reveal here why). This happened just in time, because at the end of the year there’s the Black Swan Green Grand Christmas Village Hall Disco! This already long post continues with the Black Swan Green Disco Party! Yay, I finished reading my first book! And although I really didn’t expect it (and got a little annoyed by the obviously erudite blah blah of the author at first), I absolutely loved it! I’m talking about The Following Story by the Dutch author Cees Nooteboom, which I (dôh) read in my native language: Het volgende verhaal. I probably would have never read it if it hadn’t been recommended by my all-time favourite author David Mitchell. 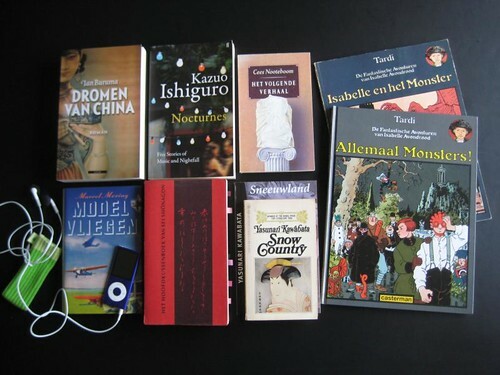 The story goes that while he was in Holland researching The Thousand Autumns of Jacob de Zoet on a writer’s fellowship, he picked up Nooteboom’s novella while he took cover in Waterstones’ bookstore during an awful downpour — and he couldn’t stop reading. Nooteboom is being acknowledged in ‘Jacob de Zoet’, so I guess they met afterwards. I almost bought myself a second hand copy of The Following Story, but discovered — just in time! — that I already owned it! That’s what happens sometimes with the free publications of National Book Week… So I might have never picked up this book if it hadn’t been for Mitchell. Worse: it could have ended up in a Boekgrrls book swap unread! But just now I recommended it for the new Boekgrrls reading schedule… Let’s hope it’ll be picked! I plan to write a short review after the readathon has ended. But one thing I can tell you already: this book has made me want to visit Lisbon! How appropriate, since the hour 8 mini-challenge on The Adventures of an Intrepid Reader is about Arm Chair Travelling! Now I’m really curious to hear what tanabata of In Spring it is the Dawn thinks of The Following Story! 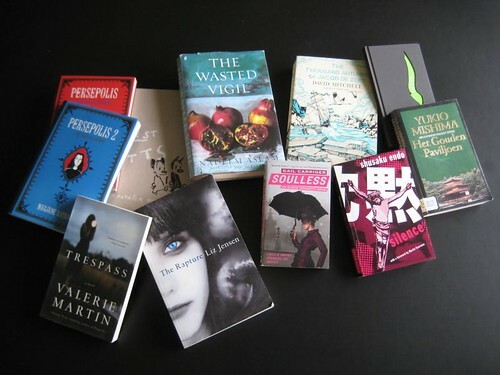 Also, I finally got around to making a donation so that those generous people providing prizes for the readathon are able to send it to the lucky winners. Let’s return some love to all those book bloggers behind the scenes of the 24 Hour Read-a-Thon! This year our first niece and nephew turned 10, just the age I had been waiting for! I gave this childhood treasure as a present to them both (which is only available second hand these days). One of them even called to tell us how great it was! These are the books I’ll be picking from next Saturday, when I’m participating in the fall 24 Hour Read-a-thon (starting at 14:00 local time). As you may notice it is an a-typical pile in that they’re mainly Dutch titles! The bulk of my yearly reads is in English but I decided to make it easy for myself since I haven’t been reading much lately and I may be easily distracted the coming weekend as well. 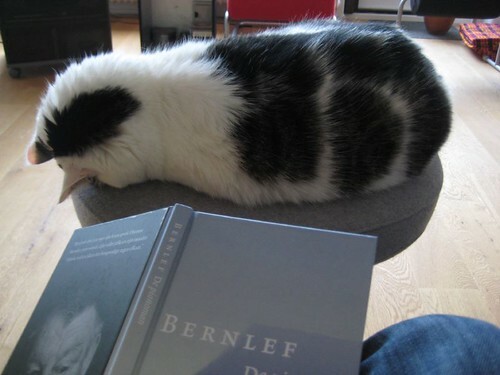 Juno, one of my kittehs, is very ill and last Sunday we didn’t even think she’d make it till readathon weekend. But this tough old gal is still fighting to get better! So instead of her keeping me company in my reading chair and bed (like previous RaTs), I might go sit with her on a pillow in a corner of the room. Less comfy, but darn well cosy and I’d be so much enjoying her presence! Of course if worse comes to worst I might drop out of the challenge to read for 24 hours. But let’s not think about that yet! Now, which books are you looking at in that picture (clockwise)? I feel like starting these books RIGHT NOW — all at the same time! LOL But I guess I’m most excited about The Following Story because it was recommended by David Mitchell and I will be buddy reading it with tanabata from In Spring it is the Dawn. That’ll be so much fun! It’s a story about Herman Mussert (a former teacher of Latin and Greek), who falls asleep in Amsterdam one evening only to wake up in a hotel room in Lisbon with the fear that he is dead. The story traces the real-life career of a Manchurian-born Japanese movie star, known variously as Ri Koran, Shirley Yamaguchi and Yoshiko Yamaguchi. Her three incarnations act before very different backdrops: the colonial experiment of “New Asia” in the 1930s and 1940s, the post-war MacArthur administration, culminating in the student protests of 1960; and the armed resistance of the Japanese Red Army in Palestine in the 1970s. But Yamaguchi merely guest-stars in her own biopic, for each section is narrated by a different man: a China-loving mentor, a restless American expat, and a pornographer-turned-terrorist. This year’s graphic novels are from Tardi’s series about Les Aventures extraordinaires d’Adèle Blanc-Sec. I’ll be rereading these because part of the adventures take place in Paris (France) and Mr Gnoe and I have been photographing the very same places when we were there a month ago. Our plan is to make a thematic Google map! 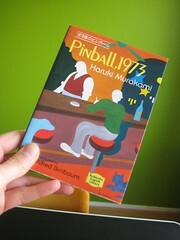 Having graphic novels at hand for a change of palate is one of the great tips I got when I first joined the readathon. Although I was completely wrong in thinking that reading comics takes less time… It rather doubles it: reading the story and looking at the pictures! This means I need to read a book a month (amounting to 1437 pages in total)… Gotta speed up! If you’d like to join the challenge as well (you actually only need to read one book by a Japanese author!) I can recommend Be With You (Takuji Ichikawa), one of my 2 favourite reads of 2009: The Old Capital (Yasunari Kawabata), The Housekeeper and the Professor (Yoko Ogawa) and any book by Haruki Murakami or Kazuo Ishiguro. The other MAJOR EVENT I’m looking forward to is a trip to Teylers Museum in Haarlem next Saturday, where I’ll be listening to David Mitchell talking about his inspiration for Dr. Marinus in The Thousand Autumns of Jacob de Zoet. 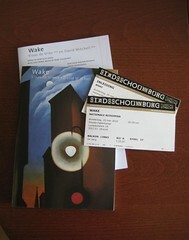 Of course I’ll also have my copy signed, together with our program guide of the opera Wake for which Mitchell wrote the libretto. I hope I won’t be tongue-tied this time… As a non-smoker I need to ask him not to draw a joint — he did that twice before when we got our books signed LOL. I’m enjoying Sei Shōnagon’s book more than before. Although I’m really more of a plot-reader I like to learn about the culture & court life of 10th century Japan. I was surprised to find out that Shōnagon was not just writing her journal out of her own initiative but that ‘people’ were expecting her to write everything down and not leave anything out… (entry #67). Also, there are more ladies called Shōnagon among the courtesans: Gen Shōnagon and Shin Shōnagon. Does the name mean something special relating to court? Do the women get a new name (pseudonym) once they enter the Empress’s circle? I hope to find out someway! Maybe you can tell me? ‘Tentô-mushi,’ he says, and she nods with a schoolmistress’s approval. In my post about bento #101 I mentioned I’ll be celebrating my 3rd year as a bento-grrl next month, on June 16th to be precise. 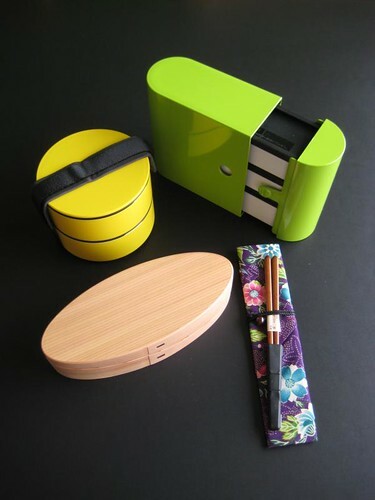 In the past years I haven’t really indulged in buying many (and more) bento boxes. I purchased four for myself in those early days — not counting Mr Gnoe’s box — and one of them broke on the way back from last year’s hanami picnic. You could say I own a box a year ;) I’ve behaved so well all this time!